In last week’s post, we have learned that quadrilaterals with congruent opposite sides are parallelograms. In this post, we show a related theorem. That is, quadrilaterals whose opposite angles are congruent are parallelograms. 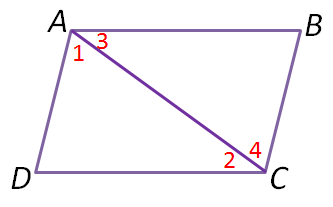 In the figure above, is a quadrilateral where and are congruent and and are congruent. In proving the theorem, we need to show that the opposite sides of are parallel. That is is parallel to and is parallel to . If the opposite angles of a quadrilateral are congruent, then the quadrilateral is a parallelogram. Since both and are triangles, by the Triangle Angle Sum Theorem, the sum of their interior angles are equal (both ). Using the steps similar to the proof above, it can be shown that (left as an exercise). So, if opposite angles of a quadrilateral are congruent, then the quadrilateral is a parallelogram.